Police executed a search warrant in relation to illegal drugs, in the Te Poi area, south of Matamata at a rural address on Friday 15 February. Detective Senior Sergeant Steve Ambler, Waikato Eastern Area Criminal Investigations Manager, said large quantities of drugs including more than a kilo of dried cannabis plant material, methamphetamine and cannabis oil was found. Police also located in small quantities LSD, ecstasy and assorted other class A controlled drugs and prescription medicines. A significant amount of cash was seized along with an array of firearms and ammunition including a .22 rifle, two shotguns and various high powered hunting rifles and a M4 military style semi-automatic rifle. 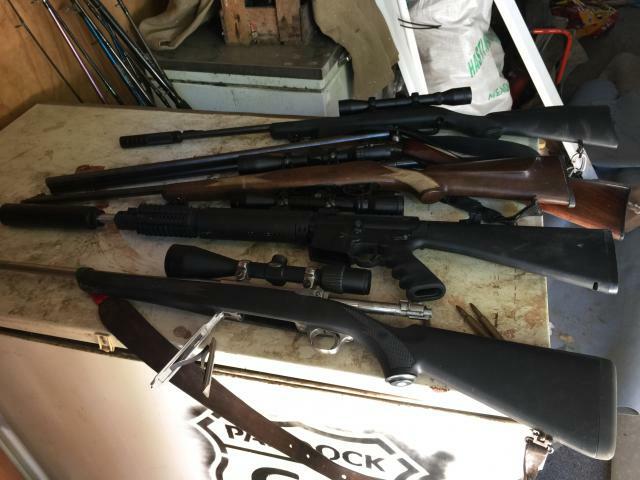 A total of nine rifles were seized from the address. Cannabis was also recovered growing at the address in various indoor concealed cabinets as well as outdoors. "Again, we would like to thank the community for noticing suspicious activity," says Detective Senior Sergeant Steve Ambler. "I am also proud of the hard work our Police teams are doing in our attempts to eradicate illegal drugs from our society." "This is a significant result again for our teams here in Waikato and we are committed to reducing the supply of drugs and reducing criminal offending." A main aim of the operation was to help the Waikato community feel safe and that police are hopeful the operation will have a positive effect in reducing drug related harm in the community. “The impact of any ongoing supply of methamphetamine on a community results in huge social harm, negative health implications and financial harm, particularly to drug users and their families." "Anyone who wishes to give information anonymously about criminal activity can do so by ringing Crimestoppers on 0800 555 111." A 34-year-old male has been arrested on serious drug and firearm offences and is due to reappear in court on the 18 February 2019.